Virginia & Truckee Railway Combination No. 18 is pictured resting quietly in the once teaming yards at Carson City, Nevada. Depicted amiably by veteran V&T photographer Bill Pennington, the comfortable coach is shown during its last decade of service before the final V&T mixed train of May 31, 1950. Specially fabricated late in 1890, No. 18 was out shopped as a first class passenger coach by the prestigious Barney & Smith Car Company of Dayton, Ohio. Established in 1849, the Barney & Smith Co. at one time was in the forefront of the dozen leading railroad car manufacturers in the United States. For more than 20 years the Barney & Smith Car Works was the largest employer in Dayton, Ohio, with over 2,000 craftsmen on its payroll turning out elegantly appointed cars for steam, electric and cable roads from its 50 acre grounds. Having expertly furnished the majority of the affiliated Carson & Colorado Railroad's narrow gauge passenger rolling stock, Barney & Smith was a logical choice by the management of the V&T when a new coach was needed to enter local service between Reno and Virginia City along with newly rebuilt Passenger Coach No. 17. Ordered by V&T Vice President H. M. Yerington late in July of 1890, the stylish No. 18 had an all wooden under frame and body measuring 50 feet 6 inches inside with 28 inch end platforms. Of Kentucky Central style, the graceful coach arrived at Carson City early in December of 1890 at a cost of $5,000. With its sides ornately lettered for immediate V&T revenue operations, the classic coach of distinctive Barney & Smith lines included plush seats, a small partitioned smoking section, a water closet and several inches of wooden shavings immediately beneath the floor boards to help maintain a quiet atmosphere while briskly traversing the 52 main line miles of the now fabled short line. During the Interstate Commerce Commission's sole Valuation Report made of the V&T Railway in 1917, No. 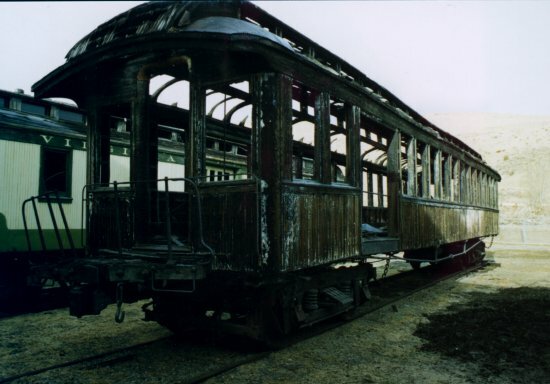 18 still was fitted with oil lights and a Baker heater, and the wood body rested atop two four wheeled composite trucks, each with 33 inch cast iron wheels and 4 x 7 inch journals. With an accrued replacement cost of $4,786, the canary yellow coach had a depreciated value of $2,693 in 1917. Following the sale of half of the V&T's fashionable passenger equipment to Southern California motion picture concerns in 1937 and 1938, No. 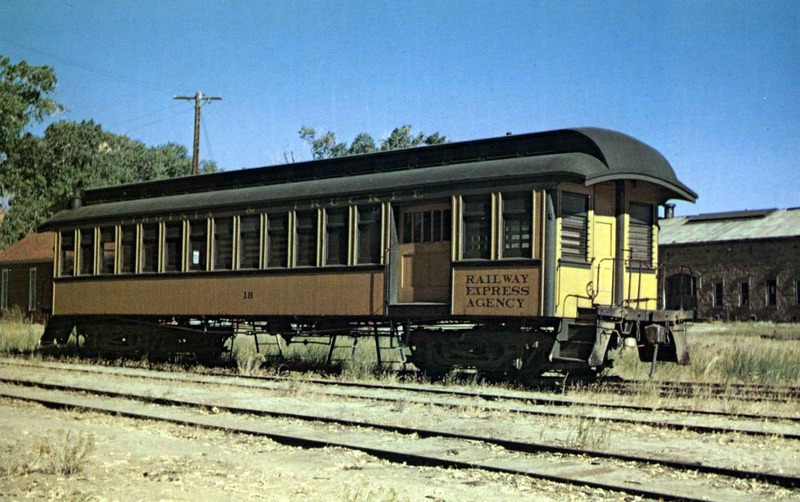 18 was converted for combination passenger and Railway Express use in 1939 for usually daily service over the 46 miles between Reno and Minden. During the final months of operation of the Nevada road in 1950, the stately combination carried 25 passengers in well appointed accommodations, plus almost 50 more in slightly less comfortable fashion on benches specially placed in the virtually deserted baggage and express section. Severely ravaged by a vandalistic fire while on display north of Carson City in 1961, the stately Barney & Smith coach today awaits the rekindling of Virginia & Truckee restoration interests in Nevada as its sole hope of revived grandeur. (Saved as a memorial to the V&T, coach No. 18 was displayed after 1955 at the north end of Carson City, along with locomotive No. 27 and baggage car No. 21 (2nd). In 1961, some kids set a fire inside the car, burning it to the skeleton that remains today. Still, much of the body structure remains, and hopefully one day it will be restored to its original glory). Shown at The Nevada State Railroad Museum awaiting restoration.